There’s a Crack Inside The Dishwasher: When you see a crack on the interior of your dishwasher, unfortunately, that means it’s time to replace the machine. There is not much that can be done for a cracked dishwasher and even if you did try to repair it, the repairs would probably exceed the price of a replacement. Better to invest in a brand new dishwasher than sink hundreds or even thousands of dollars into repairing an old one. It’s also important to make sure you get a cracked dishwasher dealt with as soon as possible since water and soap can leak through the crack and into the mechanical elements of the dishwasher. This will only create more problems and it could be a potential hazard to your home and everyone living in it. Your Dishwasher Is Twelve Years or Older: Most dishwasher manufacturers and repair experts will tell you that if a dishwasher is older than twelve years, it’s likely time to replace it. A dishwasher that is older than that simply won’t do an effective job of completely cleaning your dishes. Additionally, an older dishwasher will use up more water, thus ramping up your energy bill every month. Save money and aggravation by replacing an older dishwasher when it needs to be replaced rather than when it breaks down for good unexpectedly and leaves you without a dishwasher until a new one can be installed. Your Dishes Come Out Clean, But Never Dry: Perhaps your dishwasher is still cleaning your dishes properly but every time you open it up, the dishes are drenched in water. This is a sign that something is wrong with the heating element in the dishwasher that is designed to dry the dishes. Although a broken heating element is not the worst thing that could happen to a dishwasher, it certainly is an inconvenience and means you’ll waste time hand drying your dishes when they could just be automatically dried in the dishwasher. A simple phone call to an appliance repair technician is all that’s needed to get a new heating element installed in no time at all. The Dishwasher Seems to be Running Longer Than Usual: A dishwasher that takes too long to run it’s cycle needs to be repaired by an expert technician so that the issue doesn’t continue to waste water and money. A dishwasher’s water needs to be 120 degrees Fahrenheit and if it isn’t, the cycle will run longer than it ought to. If you suspect your dishwasher is running too long, take the water from whatever faucet is nearest your dishwasher and put a thermometer underneath the water. If the thermometer does not show a temperature of 120 degrees or higher, it’s time to call in a repair tech to get the water working correctly and at the appropriate temperature. Only then will your dishwasher run its normal cycle. Water Isn’t Draining Out of the Dishwasher After a Cycle: So your dishwasher still gets the job of cleaning your dishes done, but every time you open it up after a cycle, it’s flooded with water. First, make sure there isn’t anything clogging the drain, like food or other foreign particles. If the drain is clear, there is a deeper issue with the drainage system that will require the help of a professional repair technician. The sooner you get a minor issue like this addressed, the sooner you can thwart any possibilities of more costly damage. 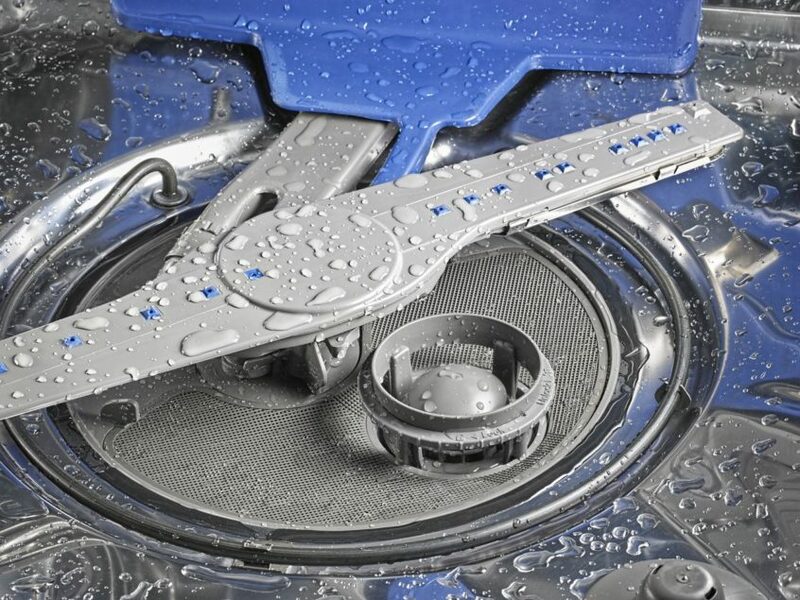 Sometimes, a dishwasher has issues that don’t require a repair or replacement. We’ll go over a few of those common issues below. Your Dishes Always Come Out Streak or Spotty: Are your dishes always coming out with those annoying white streaks or spots? Those are caused by mineral deposits. This can easily be fixed by putting a water softener in the dishwasher any time you run it. You’ll also want to turn on the rinse aid feature. Finally, if for some reason the problem still persists, try using a hard water cleaner. You’ll only need to use it on your dishwasher every few months so that it can take care of any buildup. Your Dishes Come Out Greasy and Dirty: When your dishwasher doesn’t effectively clean your dishes and they routinely come out greasy, it doesn’t necessarily mean that something in your dishwasher is broken. The likely culprit is a sprayer nozzle that is clogged up due to mineral buildup and other foreign debris. Try cleaning your sprayer nozzle and running your cycle again. If the dishes come out clean, you’ll just need to routinely clean that part of your dishwasher. If the problem persists, you will want to call in a professional repair technician to get to the root of the issue. Your Rack Isn’t Rolling Smoothly: Try readjusting the rack so that it is properly aligned with the roller. If that doesn’t work, check the wheels on the rack. There’s a chance one or several of them might be broken or worn out. All you need to do is reorder the wheels and install them onto the rack. Are you currently experience problems with your dishwasher? Or is there another appliance in your home that seems to be breaking down or has stopped working entirely? Don’t hesitate to reach out to our team today! We are happy to answer any questions and address any concerns you might have. You can also visit our official website to view our extensive list of home appliance repair services.